Free through PlayStation Plus this month, if you aren't playing Rocket League, you're missing out one of the best downloadable games to hit any platform so far this year. I realize that's a pretty bold statement, but it's totally deserved. One of my favorite things about this crazy hobby of ours is that, every now and again, a great game sneaks up on you and puts a strangle hold on all of your free time. That's exactly what Rocket League has done for yours truly, mixing a pair of concepts I'm already familiar with in a bold new way, then topping the whole package off with tight controls and more than enough little hooks to keep me coming back for more. Coming from the team at Psyonix, Rocket League is the follow-up to last generation's Supersonic Acrobatic Rocket-Powered Battle Cars. While kind of fun to say, the first favor the team at Psyonix did themselves was giving Rocket League a name that's far friendlier on the tongue and easier to remember. Otherwise, we're talking about two very similar games: Soccer, but instead of people you play as cars. 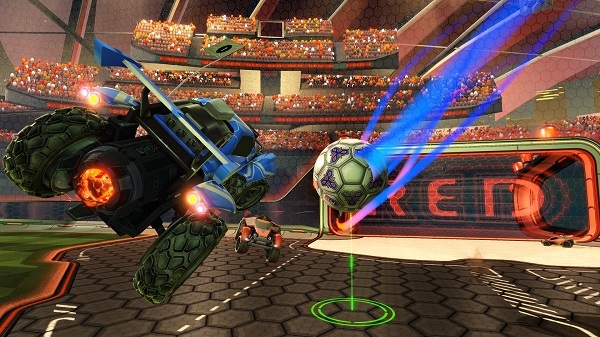 In Rocket League, you can take part in matches ranging from 1v1 on up to 4v4. You play in an arena with high walls that you can actually drive along, and the ball is about twice the size of the vehicles. At either end of the pitch is a goal and matches last five minutes. That's all there is to it. No fancy rules to learn, no weapons that you can fire at your enemies, just vehicles tearing around a field, trying to use their cars to knock a massive ball into a goal. As for your control over those cars, Psyonix has clearly spent a lot of time making sure that these bad boys feel great to drive. Controls are tight, and you've got a handbrake at your disposal in case you need to turn around on a dime. You can also hit X to jump, and tap it again to give your car an aerial boost that's great for moving the ball along more quickly or taking shots on goal. While there are no direct weapons, the pitch is littered with little panels that grant you boost. Use your boost to hit the ball harder or race in to make a clutch save, or you can actually store it up 100 percent and try to hit an opponent head-on, thus destroying their car and removing them from the game for a handful of seconds. That's not nearly as easy or as frequent as you might think. That's a super-fast moving target that you need to hit at full speed, after all. As for the camera, Psyonix wisely put in a pair of systems that lets you easily keep an eye on the game or the road ahead. The default camera is set to follow the ball, which is where I tend to keep it locked throughout matches. At the push of a button, though, you can instantly switch to a behind-the-car view, in case you want to be more aware of your surroundings than where the ball is at the moment. Rocket League boasts a lot of simple systems that work brilliantly, making for some of the most fun I've had with my PlayStation 4 all year. Making the game a Plus title was another stroke of smart thinking, as cars playing soccer is likely a tough sell to average gamers. Include it in the Instant Game Collection, though, and you've suddenly got a much larger audience that, at the very least, will likely give the game a try. So, why is this just a hands-on preview of the game instead of a full review? Because I'm basically addicted to a single mode and haven't had an opportunity to dive much further into the game just yet. What I've seen, though, leads me to believe that Rocket League is a pretty robust package, offering a wide array of customizations to unlock and modes to sink your time into. You see, I've been working on quite a few reviews as of late, and am currently in the middle of another one that's due out early this coming week. When Rocket League launched on the PlayStation Network last Tuesday, I thought I'd give it a quick gander just to see how the concept has evolved since SARPBC. Rocket League boasts a variety of tutorials, but I started off by simply learning the basic controls and jumping into the action in an online casual match. I was quickly paired up with a group of players and the action began. And then I played another match. And then another. While working on those reviews I was just talking about, I've managed to squeeze in quite a bit of Rocket League whenever possible, always jumping into the casual online fray for five minutes of mayhem. 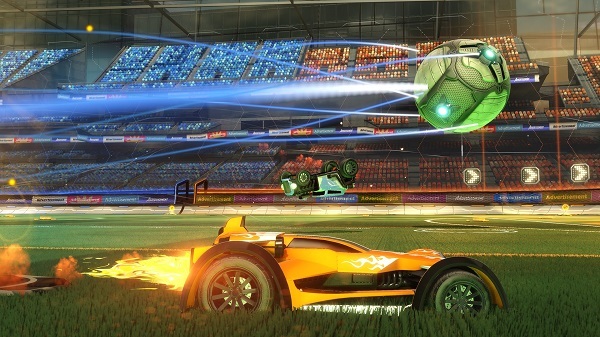 One of Rocket League's greatest strengths is that it's super intuitive and instantly fun. It's absolute chaos as players race around the pitch trying to score a goal, but there's also a sense of reason to the madness. You'd be surprised by the amount of control you can have using a car to play soccer, meaning that the regular flow of the game is full of exhilarating moment after exhilarating moment. In regular soccer games, if you want to block a shot or pass a ball to a teammate, you just need to tap a thumbstick in that direction and press a button. Those simple actions feel like monumental achievements in Rocket League, as you are basically in control of the entire foot that needs to make those simple actions occur. Passing to a teammate, for instance, means you need to be lined up just right, hit the turbo at the right moment and pray that an opponent doesn't pop up to nudge the ball off course. Getting that kind of lightning fast math just right in order to make a goal or (deliciously more exciting) block a shot from going into your own goal is hugely rewarding. I cheer, out loud, multiple times in every single match, and I'm not usually that type of player. I've been informed that I'm as entertaining to watch play the game as the game itself, if that gives you any kind of indication as to the antics that ensue while playing Rocket League. On top of the online modes, you can play matches locally or dive into a full single player season. Again, I haven't even touched those modes, but I'd be willing to bet that they're just as well put together as the online battles. While you play, you'll earn all sorts of in-game achievements for your various feats, which can be viewed in a robust stats page that gives you the lowdown on your own accomplishments and, of course, ranked and unranked leaderboards. There's also a bunch of fun goodies to unlock in Rocket League, allowing you to change the car's body, paint job, decals, hat (yes, your car can wear a hat), wheels, antenna and the like. The best part is, these changes are cosmetic only, meaning that all players stay on a level playing field. That balance is appreciated, as I can absolutely see Rocket League becoming a legitimate eSport. Honestly, I dream of the day when we get to watch teams that have become really, really good at this game duke it out in big tournaments. So, to sum up, I really, really love Rocket League. Everything about the game feels like it was built with having the most fun possible in mind. There's lots of great affects, the crowds in arenas cheer at all the right moments, and even scoring a goal causes an explosion that sends all nearby vehicles flying. Also, those five minute matches mean its perfect for the long haul or if you've just got a little bit of time to sneak in a round or two. In an era when its not uncommon to see a big publisher disrespect their fan base or a AAA title get released with issues aplenty, it's a breath of fresh air to be able to boot up something that's fast, colorful and a hell of a lot of fun to play.